I’ve compiled several “The Best…” lists that sites where you can learn about the geography, data, languages, and holidays of different countries around the world. Those resources are important, but I think it’s like learning the words, but not the music, of a song. So I thought I’d develop a separate list just focused on helping students learn about the cultures of different countries, and would love to hear additional suggestions. You might also be interested in The Best Travel Photographs Of The Year. Culture Crossing is a unique resource for information about different countries. 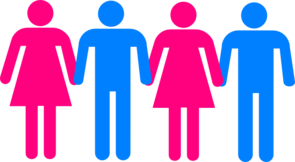 It provides some basic demographics, but it also details about communication style, dress, gestures, etc. It’s unlike any other source of information about countries that’s on the web. I’ll certainly be having my students use it now when they develop reports about countries. What The World Eats is a TIME Magazine slideshow with family photos from around the world and the food they eat. Food Photos is a similar slideshow from NPR. Here are portraits of 30 statistically average families with all of their worldly possessions displayed outside their homes. TOPICS is an online magazine for English Language Learners, and has articles and photos on the cultures of many different countries. Houses around the World, Wonderful Houses Around the World, and Homes Around The World all have images of….homes in different parts of the world. Speaking of homes, you might be interested in a lesson I did having students compare homes from their native countries with those in the United States. I wrote about it at Air Conditioning Science Lesson. Learn about Celebrations Around The World. EL Civics has a nice lesson on Clothes Around The World. I bet students would like to learn what schools in other countries serve for lunch. They can at School Lunches Around The World, School Meals From Around the World, and What’s For School Lunch? 11 School Lunches from around the World shows what the title describes, along with additional information about how the actual school lunch process works in each country. You can learn about different musical instruments at the Glossary of Folk Musical Instruments & Styles from Around the World and the World Instrument Gallery. The World’s Harvests is a slideshow from Time Magazine. It shows images from around the world of farmers harvesting various crops. Where children sleep is the title of a book and a slideshow from The Telegraph showing images of children’s bedrooms from around the world — and the obviousness inequities. What Colors Mean Across 10 Cultures is an interesting infographic (thanks to M.E. Steele-Pierce for the tip). Here are two similar infographics, though these are interactive. They look pretty neat though, I have to say, they may bee a little too wild for some students to easily understand (well, they were tricky for me, at least). And they both have the same title — Interactive Colors In Culture. And here’s the other one. Slate has a slideshow showing classrooms from throughout the world (Thanks to Eye On Education for the tip). Using the power of video to tell stories about real people and progress in global development. Believe me, that doesn’t even begin to tell you what’s there. It’s a project of a very impressive organization called Link TV, which has been on The Best Tools To Help Develop Global Media Literacy list for quite awhile. UNESCO recently reviewed its “intangible heritage list, started in 2003 to preserve the world’s art forms and traditions from the onslaught of globalization.” The Telegraph has a slideshow illustrating some of the traditions it is considering. World’s Strangest National Dishes is a good, but unfortunately named (it seems somewhat insulting to used the word “strange”), slideshow. Husband-and-wife team Peter Menzel and Faith D’Aluisio, from California, spent three years and $1 million visiting 80 individuals around the world to document what they eat on a single day. The result is a contrasting picture of what people around the globe consume. With each image Menzel and D’Aluisio add context to the profiles with essays on food politics and cultural obsessions with diet. Here is a selection of images from the book. “Around The World Via A Day’s Worth Of Foods” is a slideshow from TIME Magazine based on the same book. Fasten Your Seat Belts provides “light-hearted” videos to explain cultural norms in Asia and in Europe. You can read more about it at Free Technology for Teachers. U.S. Late To The Party On School Lunch Makeovers is the title of an NPR article and slideshow showing and describing school lunches from around the world. First Person American is a neat website that has some resources now, but won’t be completely operational until July 4th. It has multimedia recounting the travels of modern immigrants to the United States. In addition, if you are somehow connected to an immigrant, but aren’t one yourself, you can cultural-related memories. Don’t Get Me Wrong! Global Gestures is a pretty neat slideshow from LIFE. What School Lunches Look Like In 20 Countries Around The World is a nice post from BuzzFeed. I’ve previously posted about extraordinary interactive infographics made by the Wall Street Journal and The New York Times that show how people in the United States spend their time. Now, The Economist has published a chart that compares and contrasts kind of data among different countries. Eric Lafforga has some amazing photographic portraits taken from around the world. Click on “Portfolio” and then a country. You’ll then be led to countless excellent photos. The Guardian has published two slideshows showing “health messages” from around the world. Art Through Time: A Global View examines themes connecting works of art created around the world in different eras. The thirteen-part series explores diverse cultural perspectives on human experiences. It would definitely be challenging to English Language Learners, but the site looks so good I’m still going to add it to list. Daily life in May around the world is a series of photos from The Sacramento Bee. Even though I’m not thrilled at the BBC’s title for slideshow, World’s weirdest festivals, I’m still adding it to list. The world’s favourite foods is a very interesting interactive map from The Guardian. Kids Around the World offers stories of children from different countries. I think the title of Slate’s slideshow is culturally insensitive, The world’s wackiest modes of public transportation, but the photos themselves are interesting. exhibition—the first of its kind devoted to indigenous science—provides a Native perspective on global climate change. Through photographs, video, and audio of tribal communities from the Arctic to Brazil, the environmental impact of pollution is found in the stories of imposed mitigation and its consequences on local livelihoods. Without question, the best part of the site shows tons of video interviews with people from all over the world. Rare Early Photographs of Musicians Around the World is from Brain Pickings. The post has links to even more great photos. Breaking Bread Everywhere, Plentifully or Pitifully is a slideshow from The New York Times. One Day On Earth is the amazing project where people all over the world made videos of what they did on the same day. Here’s a trailer to the movie but, more importantly, here is a link to the map where you can pick a video from just about anyplace in the world and watch it. One Day on Earth – Motion Picture Trailer from One Day On Earth on Vimeo. Though I wish they had come up with a different title, The world’s strangest festivals – in pictures is from The Guardian. Where Children Sleep is the book’s website, and it has great photos of bedrooms throughout the world. Sleepers is a photo gallery from The Boston Globe and it shows people…sleeping all around the world. Moments of daily life around the world is a a photo gallery from The Sacramento Bee. Photo Gallery: Pedestrian Signals Around the World comes from Spiegel Online. A simple day in the life… is a slideshow from the Boston Globe. 50 of the World’s Best Breakfasts offers great pictures and descriptions of breakfasts from around the world. Thanks again to Michelle Henry for the tip. “Life in a Day” is a groundbreaking film produced by Ridley Scott and directed by Kevin Macdonald that solicited user-generated content from around the world that was shot on July 24, 2010. With more than 80,000 videos from 197 countries, 4,500 hours of video was edited into a 94-minute portrait of the world. In 2008 more people live in cities than in rural areas. One third of city dwellers, more than a billion people, live in slums. In The Places We Live, Magnum photographer Jonas Bendiksen presents sixteen homes in four different slum areas: Caracas, Venezuela; Mumbai, India; Nairobi, Kenya; and Jakarta, Indonesia. The exhibition, a unique multimedia installation, challenges viewers to reflect on what it means to live in a city in the 21st century. Bendiksen has visited four slums selected according to geographical spread and variation. He depicts various aspects of slum life, from worst-offs to slum chiefs. Sesame Street International: 9 Notable Muppets From Around the World is from Mental Floss. …focus on aspects of life in countries and cities around the world. What may seem ordinary and familiar to the people who live there can be surprising to those who do not. Unicef photos of the year 2011 is from The Guardian. World’s Worst Cultural Mistakes is a pretty interesting slideshow from Travel and Leisure magazine. Urban Survivors is a very well-done interactive examining four slums around the world. A Girl And Her Room is a CNN slideshow of…girls and their rooms from around the world. How Americans spend money, compared with other countries is a chart from The Washington Post. The World Stories Project is “a growing collection of traditional and new stories representing the 21 most commonly spoken languages by children across the UK. These stories can be read, listened to and downloaded in English and their original language.” It also has an extensive collection of teacher resources, including lesson plans. And it’s all free! We Are What We Eat is a pretty amazing interactive infographic on food habits in the U.S. and around the world. A Day in the World: Snapshots of , for Tomorrow is a slideshow from TIME. Foodmood shows in graphic form what foods people are tweeting about (only in English, however). You can read more about it at Information Aesthetics. Never Seconds is blog written by a nine-year-old student in Scotland. She takes photos of her school lunches and evaluates them. In addition, students from other countries have begun sending her photos of their lunches, too. The BBC reports that she has now been banned from taking photos of the lunches — NeverSeconds blogger Martha Payne banned from taking school dinner photos. (also see another BBC story here). I think it’s a safe bet to say the ban will be reversed soon — the public uproar is extraordinary. “What Eating At The Poverty Line Is Like Around The World” is a very interesting slideshow and project. The photos portray the food that a person in different countries can afford to purchase if they live in poverty. Getting Around Town is a Wall Street Journal slideshow of transportation images from around the world. by Designbysoap.Learn about infographic design/a>. by smbrtz. Browse more data visualization. School Lunches From Around The World is a slideshow from The Huffington Post. Classroom Portraits Give a Glimpse of Students’ Lives Around the World is from Slate. How people in various countries describe themselves on LinkedIn is an interesting map. A new report came out reviewing life expectancies — and quality of life — in countries all throughout the world. In addition, it compared its results with a similar report issued twenty years ago. The Washington Post turned the results into a fascinating interactive, and The Guardian did, too. What’s even more interesting is that their interactives look different, and work in different ways. All around the world, animal sounds are being heard in the language of the animal’s region or country. A dog’s bark or a cat’s meow in Canada may be understood as a completely different sound or word in Turkey or China. The differences in onomatopoeia, as animal sounds in different languages are formally known as, can be striking and to prove it we got together with a group of native speakers and recorded their “animal sounds”. We had a great time doing it and hope you enjoy it too! 55555, or, How to Laugh Online in Other Languages is from The Atlantic. 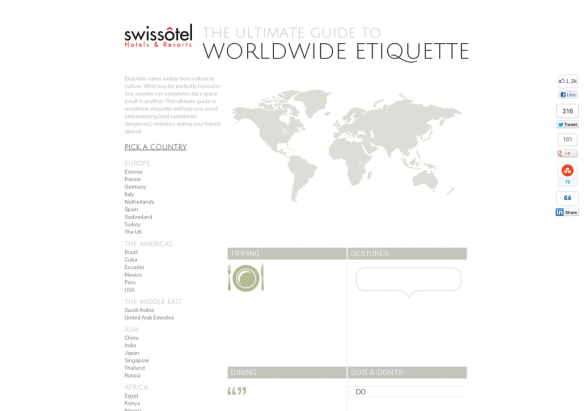 The Ultimate Guide to Worldwide Etiquette infographic by universlabs. Top 10 foreign language faux pas: in pictures is from The Telegraph. Mind the gap infographic by UNESCO Institute for statistics. Toy Stories is a fascinating series of photographs of children around the world posing with their favorite toys. Disease and death around the world visualised is from The Guardian. …calculates how much money people living at the poverty line have to spend on food each day. How Parents Around the World Describe Their Children, in Charts is a fascinating report of an the results from an international survey. The info is fascinating, and the charts make the results very accessible to students and teachers alike. 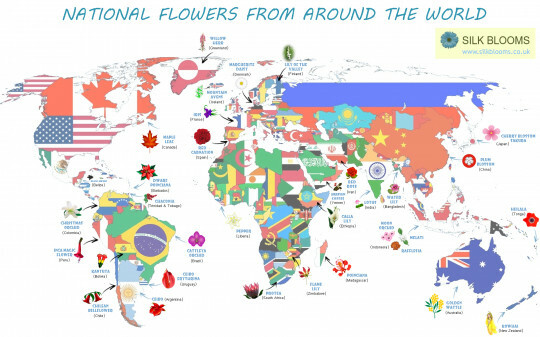 Weddings Around the World infographic by michelleink88. What American Parents Need to Do Better: Lessons from the Rest of the World is from Yahoo News. Here’s What People Eat For Breakfast Around The World is a slideshow from Business Insider. 13 Things That Americans Do That The Rest Of The World Just Finds Bizarre is from Business Insider. Languages of love: 10 unusual terms of endearment is from The BBC. The OECD Better Life Index “allows you to compare well-being across countries, based on 11 topics the OECD has identified as essential, in the areas of material living conditions and quality of life.” To Light A Fire is a beautiful collection of photographs from around the world showing the “look of reading.” infographic has some very interesting information, but it also has an unfortunately insulting title, “The World’s Weirdest Foods.” I’m still adding it, though, to list. Not only because the info is engaging, but I think the title itself can be used as a discussion prompt about perception — why do some people feel something is weird, and others do not? What might it say about the speaker (or writer)? Readers Around The World is a fascinating infographic map. UNESCO’s Memory of the World Register collects — digitally, I believe — key cultural artifacts from around the world. It’s a little difficult to get a clear sense of how it works — I think its page on Wikipedia is clearer than its own website: UNESCO’s Memory of the World Programme is an international initiative launched to safeguard the documentary heritage of humanity against collective amnesia, neglect, the ravages of time and climatic conditions, and willful and deliberate destruction. It calls for the preservation of valuable archival holdings, library collections and private individual compendia all over the world for posterity, the reconstitution of dispersed or displaced documentary heritage, and the increased accessibility to and dissemination of these items. The Register itself can be found here. Considering its wealth of resources and breadth of its collection, its surprisingly user “unfriendly.” One of these days, I hope they work with somebody like Google to really make it much more accessible. Bow Wow Meow – Animal Sounds in Different Languages from properniceinnit on Vimeo. Which countries eat the most meat? is an interactive from The Guardian. National Flags Created From the Foods Each Country Is Commonly Associated With is from Visual News. Schools Around The World is a nice photo gallery from The Boston Globe. What We Watch:a geographic exploration of popular YouTube videos is from The Massachusetts Institute of Technology, and lets you use a map to see and compare which YouTube videos are most popular in countries around the world. National Flags Made From Each Country’s Traditional Foods is from This is Marvelous. 7 Diverse Children’s Cartoons (where the main character isn’t the standard white one) is from In Culture Parent. Kids these days: A portrait of childhood around the world is from The Telegraph. Hungry Planet: What The World Eats is a photo gallery from TIME. Explore more infographics like one on the web’s largest information design community – Visually. Are you middle class? Defining the middle class around the world is from The Christian Science Monitor. My remote classroom: online students share their photos is from The Guardian. What Can We Learn From Pictures of People and Their Trash? is an article in Smithsonian Magazine about an interesting project of taking photographs of people with the trash they throw out in a week. You can see the photos here. Toys Are Us is a photo gallery of children around the world with their toys. Meals and Meal Times in English-Speaking Countries is by Tanja Batista. How Democratic and Republican morals compare to the rest of the world is from The Washington Post. 25 Fascinating Charts Of Negotiation Styles Around The World is from Business Insider. Biking, walking and public transit in cities around the world is an infographic from The Washington Post. 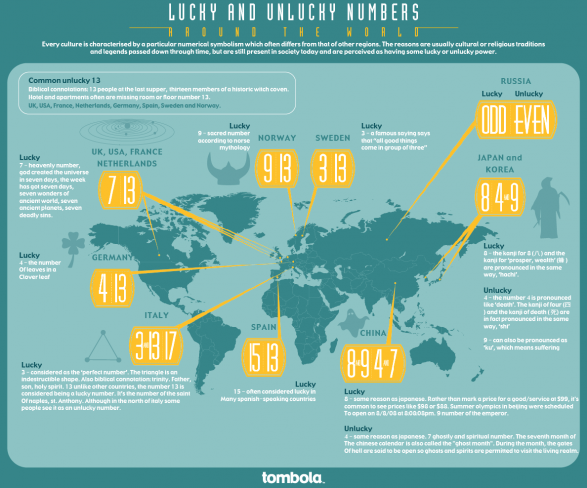 Learn more about Movie Snacks Around the World and Infographic Design from Lemonly. How do comics reflect the countries they were created in? is from The BBC. Shooting hoops around the world: Stunning pictures of basketball courts capture world’s workout below a single common hoop is from The Daily Mail. How Children Learn: Portraits of Classrooms Around the World is from Brain Picker. The Most Beautiful and Imaginative Public Schools in the World is from Flavorwire. Google autocomplete: The internet where you are is from The BBC. Chinese families’ worldly goods in Huang Qingjun’s pictures is from The BBC. The Fourth Grade Project: Life Through the Eyes of 7 Kids From Around the World is from The Huffington Post. Back to School: Classroom Portraits by Julian Germain is from TIME. What Beauty Looks Like, From Argentina to Vietnam is from The Atlantic. MAP: The most popular sport in every country is from Vox. The amazing diversity of languages around the world, in one map is also from Vox. The McDonald’s meals abroad that may come as a surprise... is actually pretty interesting and is from The Daily Mail. There seems to be a problem with the embedding function of the above infographic on funeral traditions. If you can’t see it all, then go to the direct link to see it. How The Average American Work Week Compares To The Rest Of The World is a series of infographics from Fast Company. 10 hardest working countries is an interactive from CNN. 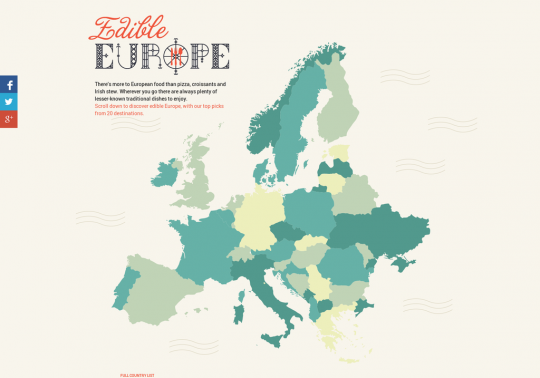 East Meets West: An Infographic Portrait is a very intriguing series. Assess Your Cultural Profile is an intriguing interactive from the Harvard Business Review. Spotify has a site called Serendipity that shows you on a map when two people in different parts of the world play a song at exactly the same time. Jawbone compares the number of steps people take each day and the amount they sleep in cities from around the world. Around The World In 8 Hospital Meals is from NPR. Hungry Planet: What The World Eats is a TIME slideshow. Global Parenting Habits That Haven’t Caught On In The U.S. is from NPR. Thanks to Richard Byrne and to InterCom, I’ve learned about a new and revised version of a neat site called Fasten Seat Belts. Gamers’ Tastes Around the World is a chart from The Wall Street Journal. The definitive guide to how people around the world snack is from The Washington Post. What Kids All Around The World Eat For Breakfast is a neat special New York Times article and photo gallery. Here’s What The “American Food” Section Of A UK Grocery Store Looks Like is from BuzzFeed. Around the World in 15 Plates of Food is from National Geographic. Today’s key fact: you are probably wrong about almost everything is a series of charts from The Guardian showing how people’s perceptions vary from reality on a number of different topics — divided by country. Bureaucratics: A Global Portrait of Red Tape is from Brain Pickings. A World of Beloved Books (According to Facebook) is from The Atlantic. What School Meals Look Like in Countries Around the World (INFOGRAPHIC) is from The Cultureist. Why do pigs oink in English, boo boo in Japanese, and nöff-nöff in Swedish? is from The Guardian. 101 Strangest Foods Around the World is from When On Earth. 30 Children from Around the World with Their Favorite Toys is from 22 Words. 10 Ways to Offend People in Other Countries is from When On Earth. Currency By Country is a useful infographic. Rude hand gestures of the world comes from The Telegraph. Chart: Americans are in an unusually good mood — all the time is from The Washington Post. What the world values, in one chart is from Vox. This Is What A Cup Of Tea Looks Like In 22 Different Countries is from BuzzFeed. The world’s most miserable countries is an infographic from The Washington Post. Death is not the end: Fascinating funeral traditions from around the globe is from TED. For a rich country, America is unusually religious and optimistic is an interesting infographic from The Washington Post. 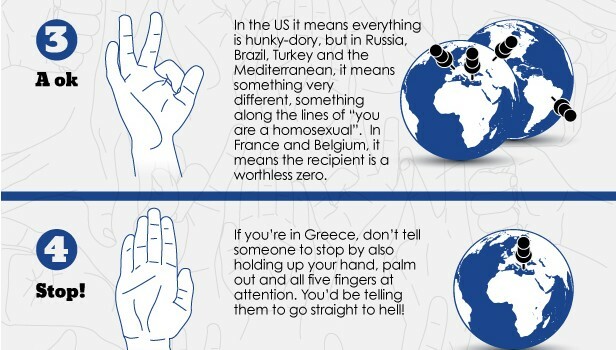 11 American Behaviors That Are Considered Rude Around the World is from Mental Floss. How stories are told around the world is from TED Talks. When you ask people around the world what makes them happy, these are just some of the answers. is from Upworthy. How your disposable income compares to other people’s around the world is from The Washington Post. Refrigerators of the World is from The Atlantic. #HIPHOPISHIPHOP is a Hip Hop version of “We Are The World” charity single. 14 rappers from 14 different countries express their love for Hip Hop in their own languages and styles. All profits will be donated for children’s education through UNICEF. You can learn more about it at The Week. 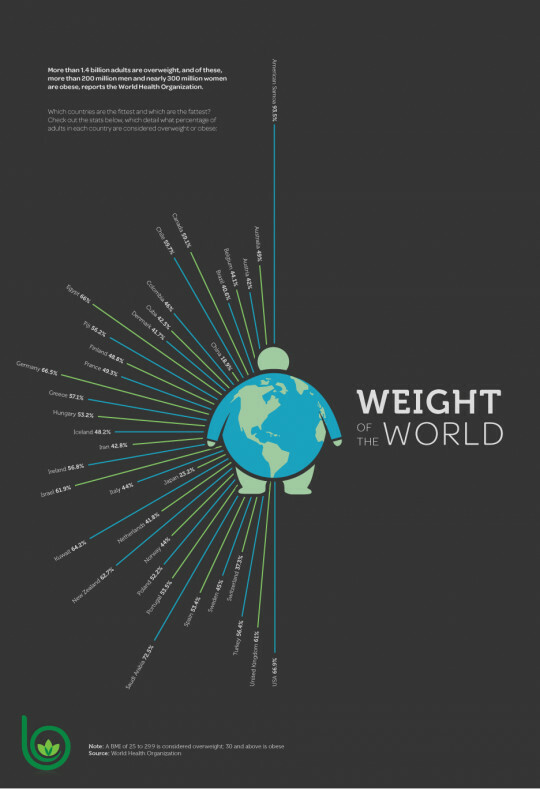 What The World Eats is an infographic from The United Nations. Photos Capture The Joy On Playgrounds Around The World is from NPR. What People Around the World Dream About is from The Atlantic. Good Morning! Breakfasts Around the 16 Countries of Eastern Europe is from When On Earth (thanks to Michelle Henry for the tip). Exams Around the World is a fascinating photo gallery from The Atlantic. A history of cities in 50 buildings – interactive is from The Guardian. Cultural Jambalaya looks like a fascinating site. Thanks to Wendi Pillars for the tip. What The World Eats is from National Geographic. How Often People in Various Countries Shower is from The Atlantic. Which country shares your parenting values? is from The PBS News Hour. “Family.Life” is a Syracuse University project that ” explores family as the center of life around the world.” The images are indexed by theme, a few of which you can see in the image at the top of this post. You can read more about what they’ve done at The New York Times article headlined A Global Look at Family and Life. Here are the most popular foods in different cities around the world is from The Washington Post. Global threat interactive: What’s the world scared of? is from The Guardian. Where Iran Is Considered a Top Threat—and Where It Isn’t is from The Atlantic. Musical Map: Cities of the World is from Spotify. Thanks to Vicki Davis for the tip. World Music Composer is a nice tool from the National Museums of Scotland to learn about musical instruments and how they sound from around the world. You can mix-and-match them to create your own collection but, unfortunately, you can save it. 21 snacks that explain our delicious world is a well-done feature from Vox. Where Instagrammers love food, mapped is from Vox. They show images of popular snacks around the world, and accompany them with short socio-political histories behind them and their popularity. Even Graphics Can Speak With a Foreign Accent is from National Geographic. 7 Naming Customs From Around the World is by Judie Haynes. The best dessert in 25 countries around the world is from Business Insider. Good Morning! Breakfasts Around the 7 Countries of Central America is from When On Earth. Photos show the views from people’s windows around the world is from The Washington Post. Learn more about Summer Treats and Infographic Design from Lemonly. How countries spend their money is from The Economist. The Cultural Differences Between East and West, as Told in Pictograms is from Slate. Where Children Learn: Inside Classrooms Around the World is a great photo gallery from NBC News. I’m also adding it to The Best Resources To Learn About World Teachers Day. The American middle class is worse off compared to others around the world is from The Washington Post. Quality of Death Around the World is from The Atlantic. Check Out Life Spans Around The World — And Likely Years Of Ill Health is from NPR. Struggle For Smarts? How Eastern And Western Cultures Tackle Learning is from NPR. A survey measured 38 countries’ support for free speech. The US came out on top. is from Vox. How Fairness Develops in Kids Around the World is from The Atlantic. What The World Eats is an interactive from National Geographic. Honesty varies significantly between countries is from Science Daily. Death on the Roads is an interactive map from the World Health Organization, and analyzes road safety laws around the world. Thanks to Google Maps Mania for the tip. How to Snore in Korean: The mystery of onomatopoeia around the world is from The Atlantic. 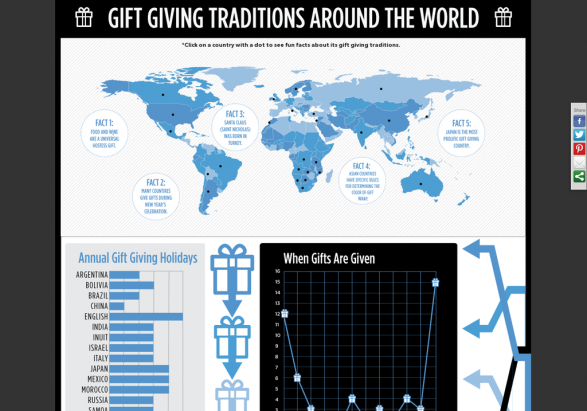 You’ll Never Guess The Most Charitable Nation In The World is from NPR. One map shows why America’s gun violence is so much worse than anywhere else is from The Washington Post. What the rest of the world wonders about America, according to Google is from The Washington Post. How well do you really know your country? Take our quiz is from The Guardian. The best and worst nutritional advice from around the world is from Vox. Which Cancer Is Most Common In Your Country? is from The Washington Post. In which country is your boss more likely to be a woman? How Classrooms Look Around The World is from The Washington Post. How Different Cultures Around the World Deal With Emotion and Conflict is from The Big Think. See The Story Of Income Inequality In Photos Of People’s Household Possessions is from Fast Company. 8 Cultural Differences Between America And Other Countries is from The Huffington Post. How We Learn Fairness is from The New Yorker. What people around the world mean when they say they’re happy is from The Washington Post. Scientists say the ways humans describe nature transcends culture and geography is from Quartz. Photos Show What It Looks Like To Dress For School Around The World is from The World Post. Radiooooo is one of the coolest music sites around. You can click a country on a world map and then click a decade from the past 120 years, and it will then play music from that area and from that time period. You can develop a list of “saved” songs, but I wasn’t able to figure out if and how you could share them. Radio Garden is an online interactive map of radio stations that you can listen to from around the world. It’s pretty nifty, and you can read more about it at The Atlantic’s article, The Map That Lets You Listen to the Radio Everywhere. Thirteen Traditional Wedding Ceremonies From Around The World is from The Week. Traditional breakfasts from around the world is from The Telegraph. Thanks to Michelle Henry for the tip. Back To School Photos from Around The World is from The Travel Channel. The world’s flags, in 7 charts is from The Washington Post. 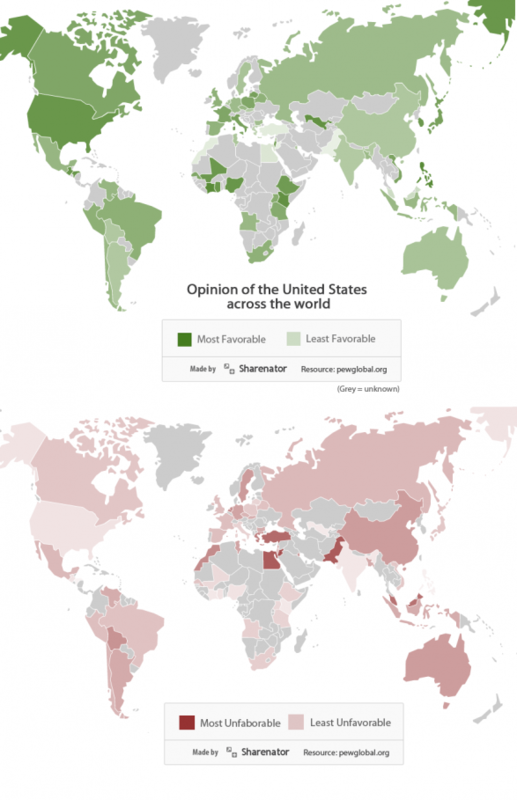 The secret to disagreeing with people from 20 different countries, in one chart is from The Washington Post. Different Cultures See Deadlines Differently is from The Harvard Business Review. What the world’s sleeping patterns look like is from Quartz. The Essentials for Giving Birth Around the World: A photo series reveals what expectant mothers in various countries bring with them to the hospital. is from The Atlantic. Why Some Cultures Frown on Smiling is also from The Atlantic. Around The World, When It Comes To Health Advice Mom Knows Best is from NPR. The pros and cons of culinary traditions receiving UNESCO status is from Eater and discusses iconic food traditions from around the world. Your Thoughts: What Does It Mean To Be A ‘Feminist’ In Your Country? is from NPR. Americans Are Shrinking, While Chinese And Koreans Sprout Up is also from NPR (here’s a cool interactive – Spanish – showing the same data). Think Americans fear vaccines? Check out the French. is from Vox. How Much Do Parents Matter? is from The Atlantic. Photos of millennials’ bedrooms around the world are a peek into global youth culture is from Quartz. How Kids Around the World Get to School is from New York Magazine. Global Indicators Data Base is a great resource from the Pew Resource Center comparing many countries based on multiple questions. A study has recently been released ranking different countries based on their level of empathy. Gapminder, the great data visualization site led by Hans Rosling (see The Best Hans Rosling Videos) has unveiled Dollar Street, which I think is an extraordinary site. They have collected 30,000 photos from 46 countries that allow you to compare, as they say, “how people really live.” You can compare bathrooms, toys – you name it. It has so much potential for so many lessons — exploring different cultures, economic analysis, geography, compare/contrast, etc. In Pictures: These Children In War Zones Are Still Attending School is from BuzzFeed News. Required reading: The books that students read in 28 countries around the world is from TED Talks. PHOTOS: Your Bedroom Says A Lot About You is from NPR. Faces Of The World’s Extreme Poor is from CBS News. Measuring The Cost Of Living Worldwide is a chart from The Economist. Global House Prices is another Economist chart. The best and worst places to be a working woman is one more Economist chart. What the world worries about is from The Economist. What ‘personal space’ looks like around the world is from the Washington Post. How do you draw a circle? We analyzed 100,000 drawings to show how culture shapes our instincts is from Quartz. The Various Rites of Passage Rituals in Different Cultures is from Buzzle. Quiz: Are You a Citizen of the World? Sample 7 Countries’ Tests is from The New York Times. What First Birthday Traditions Look Like From Cultures Around The World is from Fatherly. Google has created a site where you can see popular “How to fix” search results from around the world. AROUND THE WORLD IN 24 HOURS is from National Geographic. PHOTOS: A 4-Year Mission To Present A New Vision Of Beauty is from NPR. HOW DO FAMILIES AROUND THE WORLD SPEND THEIR VACATIONS? is from The NY Times. CONNECTING AROUND THE WORLD is from The Harvard Business Review. Here’s an interactive on World Happiness. 18 incredible traditional costumes from around the world is from The Telegraph. Some of the accompanying text is pretty condescending, but that in itself can also be good lesson material. 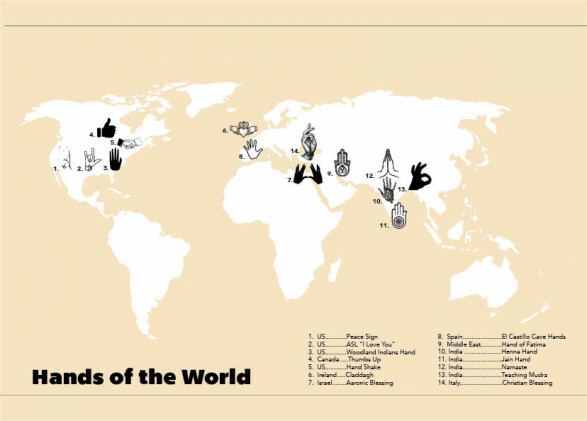 Tooth Traditions Around the World is an on-going project from Langwitches. What Kids Eat Around the World is from TIME. Hofstede Insights lets you compare countries using a few cultural characteristics. Is Music A Universal Language? Take This Cool Quiz To Find Out! The Pudding created an interactive map – with audio – where you can see and listen to the number one song (in December, 2017) in 3,000 locations around the world. People All Over The World Are Late For A Very Important Date. Is That So Bad? is from NPR. Please include attribution to KitchenCabinetKings.com with this graphic. TasteAtlas shows you traditional foods all around the world on an interactive map. You can read more about it at Google Maps Mania. Where do you fit on the global income spectrum? is a new interactive from The Washington Post that lets you identify “middle-income” in countries around the world. The Post also has an accompanying article headlined Does $60,000 make you middle-class or wealthy on Planet Earth? It’s Not Just You: 2017 Was Rough for Humanity, Study Finds is from The NY Times. GBD Compare is an impressive visualization of the causes of death in every country around the world. You can choose to have the data displayed in different chart forms. Which Countries Are the Stars of World History? is from Scientific American. 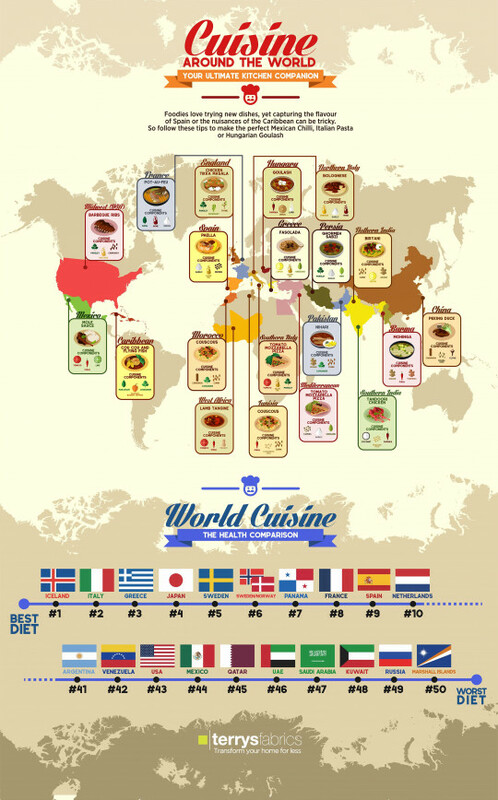 Ten signature dishes from around the world is an interesting infographic. The Different Yet Surprisingly Similar Cultures of the World is from Historyplex. Learning About Different Cultures is from Four Directions. Can I trust you? — The Impact of Trust across Cultures appeared on Medium. Mapamundi is a cool interactive that uses lots of different data to compare countries. HOME CULTURE PROJECT – WITH NEW EXAMPLES & STUDENT HANDOUTS! Again, please let me know if I’m missing some sites. Next“People who are angry pay more attention to rewards than threats” — No Kidding! Some great sites here, Larry, thanks! Will share with teachers at my school about to start a unit about different cultures. It’s important that a study of other cultures doesn’t become a superficial exploration of the “3 Fs” though (food, flags, festivals). I like the iceberg model of culture for making sure students understand that what we see if just the very tip of the iceberg and doesn’t promote deep inter-cultural understanding. I went through most of these links and was amazed at the consistently high levels of quality displayed by each site. Amazing curation of a wide variety of sources. Thanks for sharing. Thank you for sharing this. What a great selection of sites for multicultural development. This is one of the most comprehensive lists of sites and resources on learning about the world that I’ve seen – and I spend a lot of time on this topic! Have you seen The Global Education Toolkit for Elementary Learners (www.globaledtoolkit.com)? Lots of classroom resources your readers and colleagues may be able to use. Thanks again for your great blog! What a fabulous resource…thanks for sharing! I am a Spanish/Cultures/ESL middle school teacher and I have used several of these sites before. I can’t wait to check out the others.